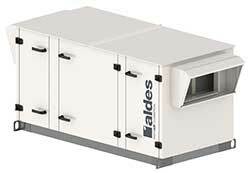 Our newest line of Commercial Heat and Energy Recovery Ventilators is now available! Great value and tons of options, all in robust, standardized cabinet sizes. 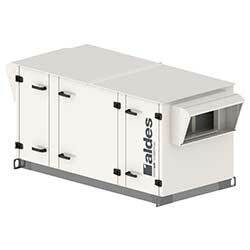 For indoor and rooftop applications from 500 to 4000 cfm. Choose among three types of fixed plate heat and energy recovery cores or an enthalpy wheel for maximum efficiency. Add heating coils, EC motors and an advanced BacNET controller to get the most out of your investment. The InspirAIR Commercial also offers an optional internal bypass channel and damper for economizer operation, with no need to connect any additional ductwork or components to the outside of the units. InspirAIR Commercial was designed for the needs of the construction industry: it’s budget-conscious yet offers a wide range of options to fit into most types of buildings and design conditions. And with American Aldes’s excellent service and delivery times, you can’t go wrong choosing InspirAIR Commercial! InspirAIR Commercial HRVs and ERVs deliver from 500 cfm to 4000 cfm of outdoor air, with optional additional heating coils and internal bypass for economizer operation – and much more! All models have robust double-wall cabinets with 1-inch (25 mm) insulation, for both indoor and outdoor applications. Outdoor units come with insulated or non-insulated roof curbs, rain gutters and supply/exhaust hoods with bird screens. Configure one or several units for your projects using our free HRV/ERV Selector software or contact an authorized Aldes distributor in your area.